Being confronted with the national flag at every turn for the past month or so should have clued you in, but here it is anyway: our illustrious motherland turns forty-seven in a couple of days. Tomorrow, Raffles Institution will be celebrating our nation’s 47th birthday with a concert featuring the usual suspects – Chinese dance, Raffles Rock, et al. – a familiar litany of performers. Overall sentiment seems to be grudging: why should one be required to stay back in school to celebrate a nation that one will leave at the drop of an A-level certificate for posh universities abroad? Then again, seeing as this gives us an extra day off, you have to admit that this is a pretty sweet deal. And speaking of sweet deals, our trusty councillors have been selling muffins and Koi bubble tea at cost price to try and generate hype. It should be noted that Koi is a Taiwanese chain, though; perhaps home-grown brands such as Each a Cup or Makeshake might have been a better choice for the celebration of our nation’s 47th. Surely the question here should not solely be a matter of tastes, but also of supporting local entrepreneurs? This allows us to segue into the topic of, ah, imported talent. Let’s talk about London. You may have missed the headlines, but Feng Tian Wei recently brought home an individual bronze in table tennis. Dissent has been roiling online, stemming from the fact that Feng is but a naturalised citizen and her Singapore passport was only printed a year before she represented us at Beijing. A quick check of the Wikipedia page shows nearly a third of the athletes representing Singapore at this year’s Games were born and raised abroad. Ah ha, the plot thickens. Athletes being hired and poached across national boundaries is by no means a trend exclusive to China. There are many other examples, such as Yamile Aldama, a triple jumper who represented Cuba in 2000, Sudan in 2004 and is jumping for Great Britain this year. The scale at which the Chinese are doing it has simply brought the issue under more scrutiny. Places as far-flung as Poland, the Netherlands and the Dominican Republic have become unlikely outposts for Chinese table tennis excellence, making table tennis events resemble domestic Chinese tournaments. Feng’s supporters may point out Rule 6 of Chapter 1 of the Olympic Charter, which states that “the Olympic Games are competitions between athletes in individual or team events and not between countries”. However, the Games are, de facto, basically about competition between countries. Why else do countries rope in local designers to design national uniforms replete with flags and symbols on athletes’ chests and backs and shoulders? Why else are anthems broadcast and flags displayed at medal ceremonies? A simple Google search for “London Olympics” even gives you a convenient little tally of medals at the side, automatically organised by country. We would be fooling no one by maintaining that the Games are not fraught with inter-nation rivalry. The notion of citizenship implies one’s agreement to cherish the same ideals and values as the rest of your countrymen and entails an entry into the social contract between a government and its loyal subjects, thereby granting one certain rights and freedoms within country borders. Admitting athletes motivated solely by the opportunity to be groomed for the Olympics into your citizenry could strip a nation’s passport of its intrinsic symbolism and turn it into a cheap license to be hawked to passing athletes instead. The thing about nationhood though, is that it is but a construct formulated by a group of people who imagine that there is some sort of communal affinity among them. In other words, it’s all in your head. 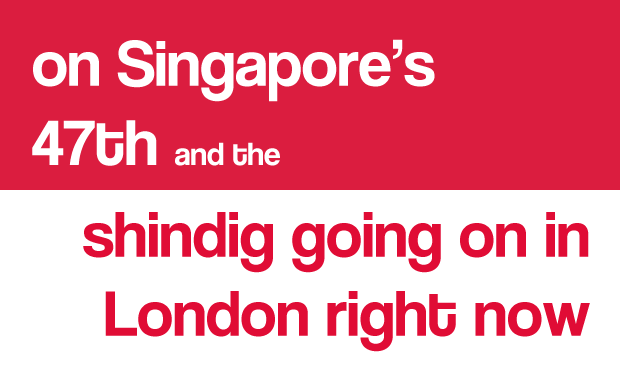 What, then, is the measure of a Singaporean? What gives us a claim to priority in the allocation of our resources? Is it simply the circumstances of our birth, our come-by-chance nationalities assigned by some cosmic genetic lottery? See if you can spot the answer in PM Lee’s face as we are plied with rehashed rhetoric on Thursday. In fact, claims that you cannot know how emotionally attached any of the China-born athletes are to Singapore can be applied to supposed “true-blue” Singaporean athletes as well. How can you be sure that, outside of calculated media statements, they are mentally reciting the pledge every time they serve? The true allegiance of our entire Olympic contingent, without the intervention of some sort of thought police, necessarily remains unfathomable. Feng’s bronze medal is often described as having ended Singapore’s 52-year-long “dry spell”. This is a term I take issue with. Such a phrase seems to imply that we should expect to receive at least some medals, otherwise it would constitute an abnormal state of affairs. That it has permeated common parlance regarding our Olympic competing history is rather telling of the attitude we take towards these games. As such a small country fielding but 20-odd athletes against the rest of the world, does probability theory not dictate that we will walk away defeated? Perhaps “fortuitious desert rain” would be a more apt description for our spotty medal history. Perhaps the whole Feng Tian Wei question should be reframed. We should not discount the value of her victory and her entitlement to a spot at the Olympics. The Singapore Sports Council gave her a job; Feng merely delivered as per the terms of her contract. Now she will be paid two hundred and fifty thousand dollars for it. It’s called outsourcing and this is not the first time you’ve seen it in action. Not in our unabashedly results-oriented nation. The real issue here then, is that the powers-that-be prioritise medals that you can wear and bite over all the nebulous ideals that a Singaporean passport stands for. In the pursuit of national prestige, they have lost sight of what it means to fly one’s own colours high. The flag that Feng wears is not just a national symbol but a mark of the transaction that has taken place – a passport for a podium photo op. It’s all business with these Games. Bear that in mind the next time you glimpse the crescent and stars on a polo shirt, soaked through with Olympic blood-sweat-and-tears. In Full Swing – IHC Day 3! Day 3 of IHC sports saw three sports being contested, namely Tennis, Swimmming/Waterpolo and Basketball, which was the main event held at the newly opened indoor basketball arena. The Basketball event was hotly contested in the Boys’ category, with the rules allowing for current players to participate in addition to many ex-players who had since quit Basketball since coming to Year 5 – it set up an exciting encounter for all 5 houses. nicely-written… (: all singaporeans should read this, not just rafflesians. If we’re willing to take some 40 children away (all our eggs in 6 or 7 baskets? Never!) at, say, age 5 or 6, then bring them to a purpose built camp where they receive minimal formal education and dedicate their entire lives to a singular sport. Then, when they are of age (typically 18 or 19? maybe 14 if you’re a gymnast, though if any IOC official asks, you’re 16), 5 or 6 of them are cobbled together into a team, then sent to compete in the Olympics. By the end of their 8-12 year run (depending on how fast age robs them of their skills), their bodies would be physiologically wrecked, their career prospects ruined by the degradation of body and minimal education. We could then cast them, along with all those who didn’t make the cut, aside, and force them into telling their Olympic medals for a pittance in order to subsist, to exist. Or we could pay these 40 people a pension for the rest of their lives. That. Is the cost of having a local podium finish. Are we sure we want that? Even the people in SOTA or Sports School (and I really, really, don’t mean any disrespect towards them. I’m hopeless at anything that involves physical exertion, and have great admiration for the athletic or artistic feats) have to have a decent education, IB or ‘O’ levels. That means an opportunity cost. Time spent studying ‘O’ level syllabus is time that could have been spent training for a local talent podium finish. I, for one, think that it’s okay for foreigners to win our medals for us. I shudder to think of a world where locals win medals every Olympics. Hey Andrew, thanks for commenting but I think what you’ve provided is quite a misrepresentation and in my opinion, a borderline elitist perspective. Apart from their sport they can get endorsements for all sorts of things; I’m sure you remember the table tennis player on the Milo packets a few years ago. When you say “minimal education”, you only take into consideration formal education. There are many other jobs they are well suited for – sports coaches, PE teachers, sports commentators, or even health and fitness models. One needs to bear in mind that a “decent” formal education is hardly the only way to get a steady job in the future.